Hi my name is Kento Kudo. I am a Remedial and Sports Massage Therapist at Perth Sports Injury Clinic. In 2008, I graduated from Roanoke College in U.S. with an Exercise Science degree. I was lucky enough to then attend the Australasia College of Natural Therapy in Sydney and received a Diploma of Remedial Massage and Sports Massage in 2010. 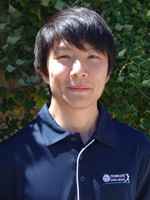 I have worked at the Japanese Acupuncture and Shiatsu clinic and Traditional Chinese Medicine clinic in Sydney as well as helping the A-league team Sydney FC for 2010-2011 Season. I use a combination of deep tissue massage, trigger point, myofascial release and stretches to achieve the best result for my patients’ condition. My interest includes treatments that bring relief for headaches, shoulder pain, lower back pain, hamstring strain, knee pain and any sports or muscular injuries. Find out more or call us today.